Made of high-quality stainless steel 304, our professional garlic press is meant for long service life. Silicone garlic peeler and the cleaning brush are both FDA approved. Feel safe to use. Come with clean brush and peeler, our garlic mincer set meets your needs perfectly. The crusher is dishwasher-safe. Simply use dishwasher or brush to clean the garlic crusher. 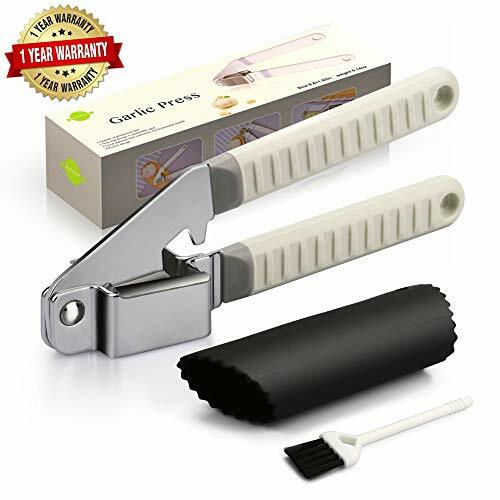 1.Peel garlic clove in seconds with our silicone roller. 2.Put peeled garlic into the grinder, and hold rockers together to get minced garlic.